The independent internet journalist Don Surber has produced a terrific short catalogue and analysis of how everyone—but especially the conservative commentariat—missed or misunderstood the rise of Donald Trump. 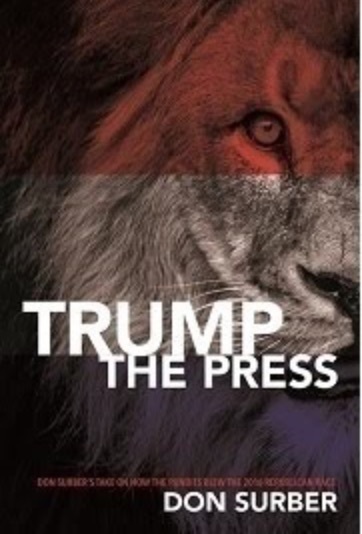 You can order the e-book version of Trump the Press: Don Surber’s Take on How the Pundits Blew the 2016 Republican Race directly from Amazon subsidiary CreateSpace. The book is a wonderful catalogue of all the pundits who completely dismissed Trump from the beginning (including yours truly, though Don was kind enough not to quote my faulty Los Angeles Times prediction last August that Trump would be “gone by Thanksgiving”). “Trump has a better chance of cameoing in another Home Alone movie with Macaulay Culkin—or playing in the NBA Finals—than winning the Republican nomination.”—Harry Enten, FiveThirtyEightPolitics, June 16, 2016. “His candidacy has been a joke from the start. He makes for great copy, but so did Jack the Ripper,” Democratic strategist Peter Fenn, US News and World Report, July 20, 2015. There’s lots more where these came from. Worth buying the whole thing; it’s a brisk 127 pages that you can read easily in one long sitting. In the “I wish I had thought of that” department, Don goes on to compare “Peak Trump” to “Peak Oil,” which is perfect. I repeat that I think Trump is a high-risk proposition to win the election, and I am doubtful about his ability to govern if he does. But Surber’s book is a very useful collection of the cluelessness of the political class, along with a worthy analysis of how the conservative establishment needs to do some serious rethinking whatever the outcome in November.